LTD has taken the fear out of owning a Cadillac. Paul and the service dept always pull through. I would recomend them to friends & family. The guys at Living the Dream Auto treat my car as if it was their own. They provide expert service, quickly and professionaly. They do exactly what needs to be done, and not one thing more. When I go in, they greet me by name (even though I have only visited several times) and make me feel like a friend. They are by far the best auto service I've ever experienced. I hope they stay in busines forever. I'm so impressed with them that I know this review sounds as if it was written by the owner. But I am simply a very happy customer who wished that he had found out about Living the Dream Auto sooner. Brakes sounded weird so we brought the car in with no appointment and next day we had the car back fixed... at a reasonable cost too! Thanks! Living The Dream Auto Care is what customer satisfaction is all about. Use of the internet for scheduled appointments, reminders and estimates is an added convenience. Thank you for the ride home and back to your shop. Waiting with my 3 boys would have been challening for 4 hours! I really do appreciate the time you took to facilitate my experience. Very happy with the service that I have received on both my vehicles. A great experience. I particularly liked the discussion of options available to me about work that should be done immediately and work that could be postponed. I was provided information regarding the use of after-market parts. 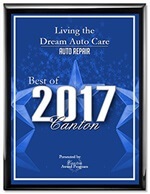 In one case, the after-market part was recommended while in another instance the Honda part was recommended.A friend highly recommended Living the Dream Auto Care in Canton, MA when I was inquiring about a repair shop for my Honda Pilot. Although they have a competitive $19.99 oil change, I opted for the more expensive oil change service that included a complete review of my car's needs. I had my list of things as well. I was given a complimentary ride to work and a few minutes later Paul called to go over both my list and other items that their review had found. We agreed on the work and later in the day, I was picked up at work.The final price was fair and the car feels almost new. Paul thoroughly discussed the completed work and future routine maintenance that would be needed. A real nice bonus was the fact that my car had been washed and thoroughly vacuumed.This place is immaculate, has a playroom for children and internet access for those choosing to wait. Unfortunately, their coffee machine broke while I was there but they offered to get a cup of coffee from the Honey Dew Donuts next door.Choosing an auto repair shop is blind shopping. One really does not know how good the outcome will be. I never felt pressured. You will not go wrong choosing Living the Dream Auto Care. Undoubtedly the most honest and professional body shop/mechanics that I've ever done business with. I sent my dauther for a service to her car.I was very pleased with the treatment she got.